last March. Between multi-channel funnels, real time, flow visualization, premium, and a whole host of other incredible features, it is hard to believe that only a year has gone by. We are excited to announce that Analytics reports can now be automatically sent to yourself or other members of your team from within the new Google Analytics. These reports can be set up to email at a variety of regularly scheduled times, including daily, weekly, monthly, and quarterly. 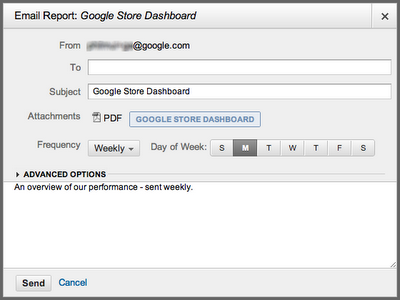 Reports can also be exported to PDF allowing you to save or share the insights you’ve found using Google Analytics. For those who have used the email scheduler in the old interface, this new emailer system operates independently and has enhancements in reliability and ease of use. We are putting the finishing touches on the look and feel of exported reports, and anticipate that these will be finalized soon. Part of the transition to the new emailing system is an opportunity to "reset" your scheduled emails. Consider which scheduled emails have been most helpful and be sure to recreate those in the new interface. The new Google Analytics has some reporting differences and additional metrics that you may want to take advantage of when drafting new scheduled emails. We will provide ample notice before scheduled emails from the old Google Analytics are sunset later this year. We would love to hear how the release of these features helps you to be efficient and derive valuable insights. Let us know your thoughts in the comments. Happy exporting! The new Google Analytics has come a long way since it was first unveiled last March. Between multi-channel funnels, real time, flow visualization, premium, and a whole host of other incredible features, it is hard to believe that only a year has gone by.